The combination of features in Steeldeck® platforms, as with all systems, represents a compromise between the properties we would like the system to possess – strength, ease of use, portability, versatility etc – and what is possible to achieve within certain constraints – in particular, materials and cost. We believe that Steeldeck® platform designers have achieved a unique balance here. What follows is a list of the main features required of a modular staging system, and examples of Steeldeck® platforms’ strengths in each area. Priority among these features is dependent upon the requirements of the customer, so this is not intended to be a definitive order. However, these features are relevant to most people, most of the time. Unit prices are very competitive. 4’ x 8’ Steeldeck® platforms are less expensive than other sizes. Larger sizes are therefore better value in terms of dollars per square foot. This is due to there being fewer seams and legs in a stage made from larger units than in a stage made from smaller units. Steeldeck® platforms have a very good strength to weight ratio. A 4’ x 8’ Steeldeck® platform weighs approximately 150 lbs and supports an evenly distributed load of more than 4,000 lbs. 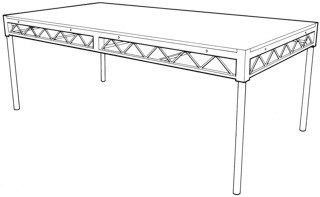 To set up a Steeldeck® platform all you have to do is insert and secure the legs and stand the deck up. Steeldeck® platforms’ simple and tool-less assembly means lower set-up and tear down times and costs. For example, a 40’ x 80’ stage can be set up by 4 men in 4 hours. Modular design means stages can be erected in a variety of shapes and sizes. 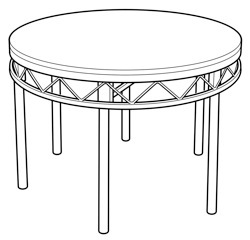 For a different stage height, just change the legs. Flat platforms, tiers, or ramps can be made from the same standard units. The steel construction means Steeldeck® platforms have a very long life. The no-nonsense design leaves virtually nothing to break or give out with wear. Some competitors make a healthy proportion of their turnover from selling replacement parts for their equipment. Steeldeck, Inc does not. The decks we make today are compatible with the decks we made in 1985. No built-in obsolescence with Steeldeck. Steeldeck® platforms’ durability radically lowers maintenance costs. 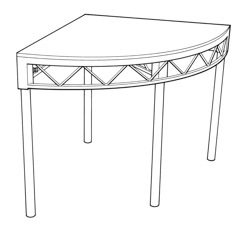 Tops and legs are made from standard materials, so they are easy and economical for the customer to source and replace. The use of steel rather than aluminum for the frame makes inexpensive repair of damage possible. In manufacturing, we order lengths of steel and sizes of plywood which minimize waste. Considering the number of platforms we manufacture, we rarely visit the recycling yard. In rentals, we achieve a minimum of waste by reusing short lengths of pipe for custom size legs and cutting down sheets of plywood for the tops of small custom-size decks. We use local suppliers for our fasteners and finishing requirements, minimizing unnecessary transportation. We order materials in bulk, avoiding multiple deliveries. Our large range of equipment allows us to make customized reusable stages without the need to fabricate actual custom elements, which are usually destroyed at the end of a job. 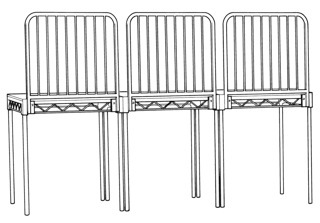 Stair units, guardrails, casters, carts, and bracing are available. Special size Steeldeck® platforms can be made to order. Steeldeck® platforms stack conveniently, and are easy to forklift or pallet jack. Steeldeck® platforms can be stored flat or on edge. Legs can be stored easily, in the stacks of decks, or in leg racks. Casters can quickly transform a Steeldeck® platform into a cart. A ratchet strap holds the stack tight, and one person can wheel the stack into position. Triangles, curves, and custom shapes can be made to order. Steeldeck® platform tops are normally supplied with a painted surface, but special finishes can be supplied if required. It is common for customers to ask about alternative deck styles or features, as part of their assessment of other products. Below are a few points about some of the alternatives available, and their relationship to Steeldeck® platforms. Steeldeck® platforms will not be suitable in every case. We are not trying to pretend that they would be, nor would we wish to force Steeldeck® platforms on a customer for whom they are unsuitable. We believe this would be a shortsighted policy, which does not accord with our overall approach. Steel is less expensive than aluminum. Steel is far stronger than aluminum, although it is heavier. Since the frame constitutes only half the weight of a Steeldeck® platform (the other half is the plywood) the weight difference between a Steeldeck® platform and an aluminum platform is much less than people expect. Aluminum is so much weaker than steel, that for a reasonable strength to be achieved, the volume of material used must be increased, either in the frame or via the use of bracing – thus further eroding the weight advantage, and inevitably leading to higher costs. Steel is extremely durable, but aluminum deforms easily. Steel is also easier, and therefore less expensive, to weld. Consequently, a platform made from steel is less likely to be damaged by a given application of force than one made from aluminum, but if it is damaged, it is easier to repair. Steeldeck® platforms use standard 1½” schedule 40 pipe as legs. This has several benefits. Because they are made from a standard product, they are less expensive than proprietary brand legs or frames, and the material is widely available throughout the world. They are simpler and stronger than scissor-type legs. 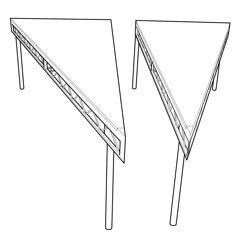 Scissor legs offer a number of height options, which appear to be very convenient. It is rare, however that a customer wishes to be limited to these heights for the life of the product. Greater versatility is achieved by the Steeldeck® approach, as well as significant cost savings. Unlike systems which use proprietary leg systems, Steeldeck® platforms use standard steel pipe which also enables legs to be cut for special heights (to match existing stages), and allows the use of standard scaffolding accessories such as screwjacks, casters, and bracing. Steeldeck® platforms are supplied with tops to the customer’s specification. Standard is 7- ply MDO Douglas Fir exterior plywood. Other plywood and veneers are available. Tops can be finished with non-slip floor paints, clear or staining sealants, bar grating, or Plexiglas®. Steeldeck® platforms can also be supplied without tops, at a reduced cost. Steeldeck® platforms are not supplied with coffin locks, due to the expense and short service life of the hardware. Coffin locks can be fitted to Steeldeck® platforms as a cost option. This is applicable when access to the underside of the platform is limited or impossible.